Arris Engineering provided engineering services for a new mixed-use facility. The Congregation of the Sisters, Servants of the Immaculate Heart of Mary is a new, four-story, 138,000 square foot facility. The facility consists of a resident area, convent, hospitality and welcoming center, PACE and therapy area, kitchen and cafeteria spaces. The resident area consists of (3) 4-story resident household wings containing 10 resident units per household. 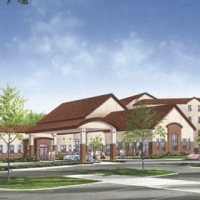 Resident support spaces include staff rooms, bathing, restroom, elevators, storage, mechanical/utility, and stairwells. Convent public spaces include multi-purpose dining, administration, chapel, beauty, gallery, gift shop, parlors, café and bistro. The hospitality and welcoming center consists of a vestibule, reception area, lobby, offices, and restrooms.